Item is used and in very good condition but is missing original packaging. There may be some cosmetic flaws such as dents and scratches. Ideal for holiday entertaining, everyday dinners, barbecues, and more, this sleek electric carving knife offers simplicity and ease of use unmatched by traditional manual knives. The unit features a 7-inch serrated stainless-steel blade that effortlessly portions everything from turkey and roast beef to ham, venison, and other meats to desired thickness--from thin deli slices to mouthwatering, juicy cuts. Alternately, use the industrious knife to slice quickly through hard cheeses, create uniform slices of freshly baked bread, or slice effortlessly through hard-shelled watermelon and gourds. Its nonslip handle affords unparalleled comfort and security, while its safety lock prevents potential injury caused by accidental starts. Additional highlights include a flush-cut blade design, nonslip tabs for easy blade removal and quick cleanup, and a compact design that stashes neatly in a drawer when not in use. 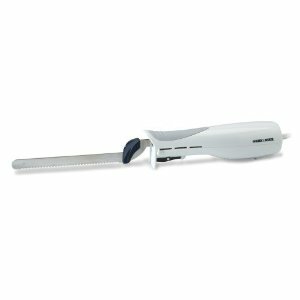 The electric carving knife measures approximately 12-2/5 by 2-4/5 by 3-1/5 inches.